MODERN IS TIMELESS - Design Home Interiors, Mark Little - The best interior design services in Montgomery County and Bucks County and suburbs of Philadelphia. Midcentury modern style reappeared on our radar more than a decade ago, but the wildly popular show Mad Men has pushed it even farther into the limelight. Just as the name implies, it spanned a period of roughly two and a half decades in the middle of the 20th century, from the mid-1940s to 1970. Its uncomplicated, fresh aesthetic arose from a desire to propel postwar America into the modern era and recast design through a bold new lens. Furniture pieces of this era are characterized by their clean, simple lines. Wood pieces, often made of teak, are simply finished to showcase their natural beauty. Midcentury Modern is a growing trend, but most people don't want to live in a home that looks like a time capsule. Combining the clean lines of a tufted midcentury sofa with table lamps and artwork that have more traditional elements is one way to get a retro-inspired look without going overboard. Midcentury interiors are all about organic style and ease of living, and that's reflected in their structure and fabrics. Furnishings and floor plans are stripped down to their essential forms, with no excess detailing or unnecessary add-ons. 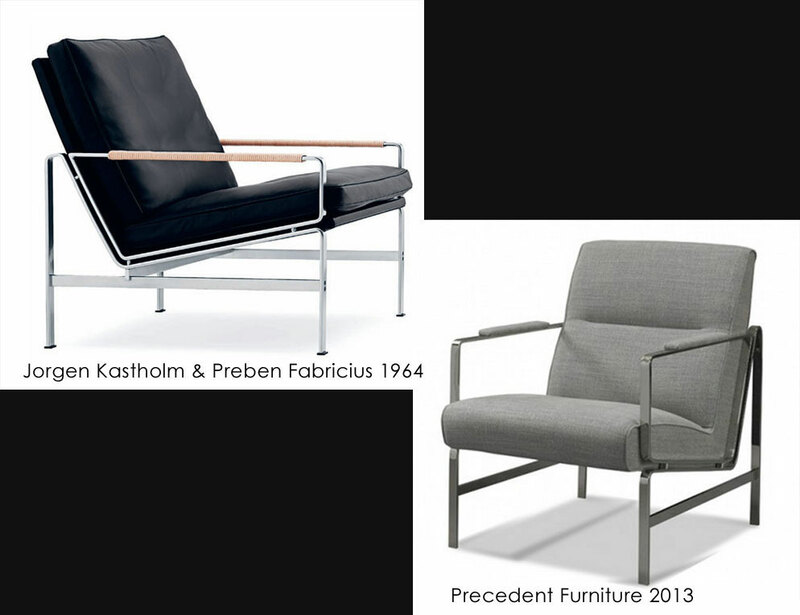 Check out the 6720A chair (left) designed by Jorgen Kastholm & Preben Fabricius in 1964. A simple, well-structured frame supports the chair cushion without adding extra detailing. Precedent’s 2014 rendition (right) refabricates this same simplistic form without reinventing the wheel. This chaise from Dwell Studio (right) is inspired by the classic 5490 chair (left) designed by George Nelson in 1954, but offers a slightly more comfortable seating pitch. 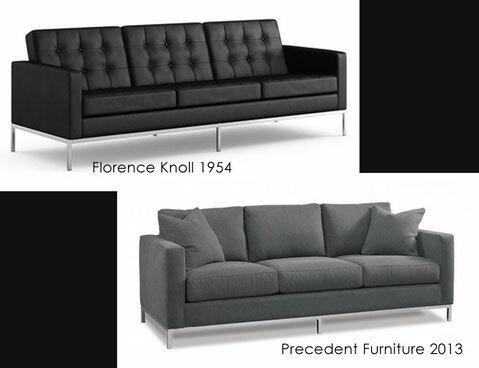 Midcentury sofa’s are typically more “authentically” proportioned for smaller rooms with lower ceilings. Precedent’s rendition (right) of Florence Knoll’s 1954 sofa (left) mirrors the long, low, horizontal lines often portrayed in Midcentury furniture. 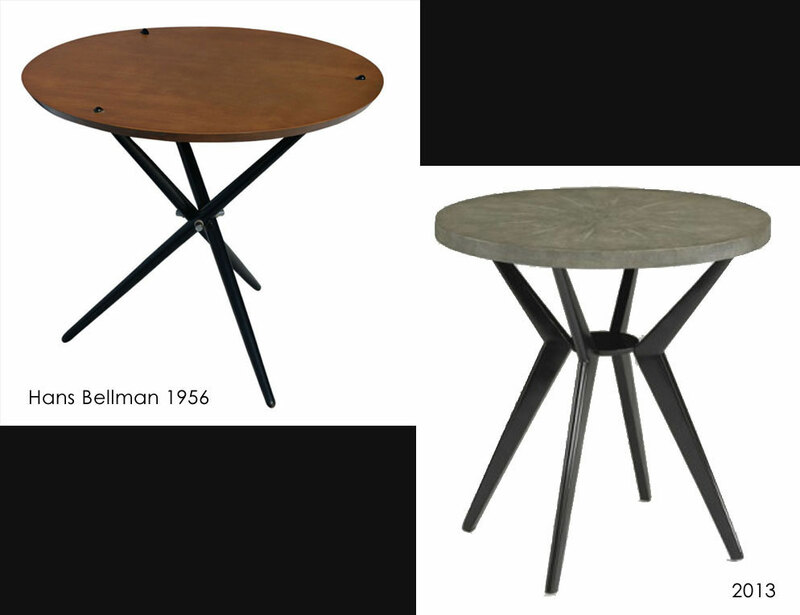 This 2013 remake (right) of Hans Bellman’s 1956 Tripod table (left) is sure to suit the needs of any homeowner, and is modest enough to blend with many different home and furniture styles. 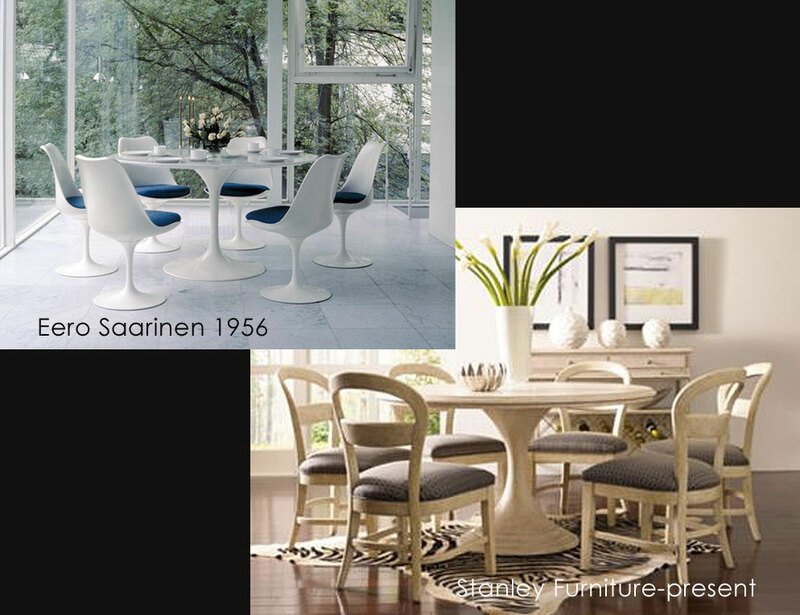 When Eero Saarinen designed his modern classic Oval 174 table (left) in 1956 he wanted to eliminate any extra parts, including nonessential table legs. Stanley Furniture’s current re-creation (right) draws attention to the simple lines of the table while maintaining a fresh and modern look. Adding a Midcentury effect to a room can be easily balanced given the right mixture of pieces. 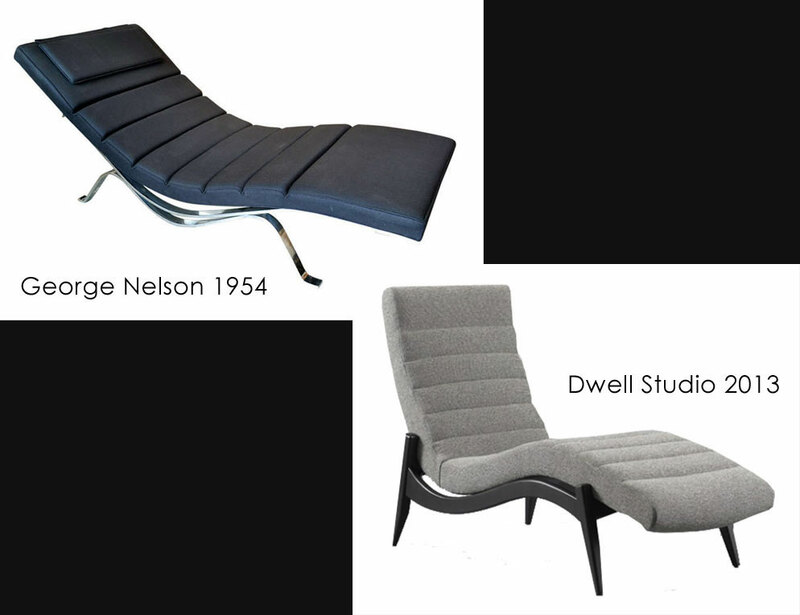 To check out some of the latest Midcentury Modern renditions that are made in the US, make an appointment with one of our designers or stop by our showroom and see the latest looks. 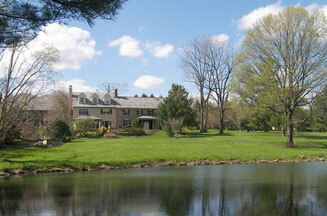 Situated on nine wooded acres in Doylestown Township, Serendipity Farm has been selected by the Village Improvement Association of Doylestown as the 39th Bucks County Designer House & Gardens. Over the past 245 years of this former working farm's history, it has undergone several expansions and renovations and now includes amenities found in a modern home. In 2014, it will be changed once again, in grand style, by a team of talented professionals who will soon descend on the main house, guest house, outbuildings and grounds to transform the estate into a stunning showcase. What's Taking place i am new to this, I stumbled upon this I've discovered It positively useful and it has aided me out loads. I am hoping to contribute & assist other users like its aided me. Great job. Thankfulness to my father who informed me about this web site, this weblog is truly awesome. I really like what you guys tend to be up too. This sort of clever work and exposure! Keep up the terrific works guys I've included you guys to blogroll. Wonderful goods from you, man. I've understand your stuff previous to and you are just extremely wonderful. I really like what you have acquired here, certainly like what you are stating and the way in which you say it. You make it enjoyable and you still take care of to keep it sensible. I cant wait to read much more from you. This is really a wonderful website.